Members of the Webster University Class of 2018 celebrate at the commencement ceremony at Webster Ghana. Campus director Christa Sanders (right) conferred degrees. 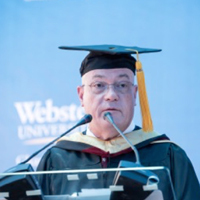 History was once again made in Ghana as members of the Webster University Class of 2018 celebrated the fourth annual commencement ceremony at Webster's campus in Accra. This year's event was happily witnessed by a near-capacity crowd of families and friends who were filled with excitement as they watched the first historical class of undergraduates and the fourth cohort of graduate students walk across the stage and receive their degree. The ceremony was also attended by dignitaries such as Ambassador of the U.S. to Ghana, Robert P. Jackson; the executive secretary of the National Council for Tertiary Education, Prof. Mohammed Salifu; and Roberto Quiroz II, public affairs officer of the U.S. Embassy in Ghana. Also in attendance was Nancy Keteku, regional Educational advising coordinator at EducationUSA. In her remarks to the Class of 2018, Webster Ghana campus director Christa Sanders challenged the graduates to make their own marks in society. "Be the change that you wish to see, especially in today's ever-complex world," she said. She further reminded the graduates that not only have they gained a prestigious globally recognized degree, but they have also inherited an extended Webster family. Ghana, delivered remarks to Webster grads. Robert P. Jackson, Ambassador of the U.S. to Ghana, delivered the Commencement Address at the ceremony. He urged the Class of 2018 to seek careers that will fulfill a purpose in their lives as individuals. "Take the harder path. Learn from your mistakes. Let your struggles shape you for your purpose," he said. Ambassador Jackson, having served in a number of foreign countries with a career spanning 36 years plus of diplomatic service, was highly honored to end his diplomatic career serving as Webster Ghana's commencement speaker. Other speakers took turns addressing the graduates, including Michael Williams, academic director at Webster Ghana, who thanked the outstanding community of Webster faculty for their relentless efforts and dedication. Two faculty members, Agnes Khoo-Dzisi and George Amoako, also shared remarks acknowledging the hard work, discipline, and outstanding achievements of the graduates.